What mobile platforms does Funamo support? How much does Funamo cost? Do I have to pay a monthly fee? What's the difference between Funamo Parental Control and Funamo Accountability? How to setup Funamo Accountability with an accountability partner? Do I need to sign up again if I am trying to setup a second device? How can I make sure Funamo is always running on my kid's device? My kid uses task manager/application manager app to kill Funamo. How can I prevent him/her from doing it? Funamo is not automatically restarting itself upon reboot. What could be wrong? How can I change my email/password? What happens when Funamo releases a new update on Google Play Store? Should Settings and Google Play Store password be protected? How can I allow basic settings and access to Play Store without my password? What's your recommendation on how to handle Youtube? I just setup my device, but I don't see any history data on the web. What should I do? I don't see any location information online. Is there anything I need to do? When I try to sync with the device from the web, I don't see any new history data. What's the problem? Now every time when I try to open a web link, I get the Funamo login screen. What's the problem? Does Funamo support Google Search widget? How to setup Funamo on a device that supports multiple accounts and how to prevent user from bypassing Funamo using guest account? I am seeing a message asking me to enable Funamo for application usage data and it blocks all apps. What does it mean and what should I do? How can I find out which Android version my device is running? I cannot access funamo.com website. What are the supported browsers and OSes? Funamo currently supports all Android based smartphones and tablets. The application can be downloaded from Google Play Store. Funamo comes with a two-day evaluation so you can try it out. If it meets your needs, you can simply click "Purchase Funamo Now!" in Funamo application to purchase a valid license. Or you can purchase a license directly from our website. Funamo is priced at $19.99 and it will protect your device for as long as you own it. There is NO subscription, NO monthly/annual fees. For as little as the price of a book, now you can get peace of mind with your kids' mobile devices knowing that they are protected. Please note that Funamo license is on a per-device basis, meaning you need to purchase a separate license for each device that you want Funamo to protect. And we allow license transfer within 6 months of purchase for any device issues. Funamo Parental Control and Funamo Accountability app have basically the same feature set with only minor wording differences. Funamo Parental Control is meant for parents protecting their kids and Funamo Accountability is for adults using it for themselves. You only need one or the other, and do NOT install both on the same device. In our future releases, we may add different features to them depending on the use cases. Funamo license applies to both apps. The setup process for Funamo Accountability is basically the same as Funamo Parental Control. Please refer to Funamo Parental Control page for detailed instructions and video tutorials. Please contact us if you have any questions. No, you don't. You can simply login with the email/password you created when you were setting up your first device. Funamo wizard will walk you through the steps to register your device. After you enable Funamo protection by clicking Start Funamo, Funamo will always be running in the background (you will see the dark-blue Funamo logo on the notification bar). Even if the device is rebooted, Funamo will automatically restart itself when the device is turned back on. Funamo also uploads device history data to the server on a daily basis (Please make sure that device monitoring options are enabled under Funamo -> Account settings). The time stamp of the last update is shown on the webpage. If you have not seen the data updated as expected, you may check your kid's device to see if Funamo is still running properly. After it is disabled or turned off, user can no longer open it. Please make sure that you add the Settings app to the Protected apps list, because with access to Settings, your kid will be able to re-enable the app. Funamo protection is enabled when you reboot your device. When Funamo is enabled, you should see a dark-blue F logo on your notification bar. If you expand the notification bar, you should see "Funamo protection is on". If Funamo protection is not on when you reboot your device, it will not automatically enable the protection. This is to prevent kids from turning Funamo back on by simply rebooting the device. If Funamo protection has been turned off for whatever reason, it can be turned back on only if you have the password. Please make sure that you do NOT move Funamo Parental Control to SD card after installation. Applications on the SD card can't restart automatically. Also please check if there are apps installed on your device that can enable/disable auto-start of other apps. These type of apps normally have names such as app manager, app killer, memory cleaner or device boost etc. Devices from some Asian manufacturers, such as Asus, Xiaomi, may have separate settings for app auto-restart when device reboots. Please check your device manual for details. You can change your password either from the device or from the web. It is simpler to change your password from the device. You can open Funamo on your device (stop Funamo if Funamo protection is currently on). Then click Account settings -> Change password and enter your new password. Now you can use your new password on both the device and the web. You may also change the email and/or password on the web under your profile. After you change your email/password online, you can login to Funamo app on the device using the new email/password. You can also request a password reset on the web if you completely forget your password and cannot login on either the device or the web. A randomly generated password will be sent to your email. After you receive the email, please follow the instructions in the email to login Funamo app on your device. After you login, you can go to Account settings -> Change password to change the password to something that is easier for you to remember. Now you can use your new password on both the device and the web. If you (or your accountability partner) changed the email/password online but do not have access to the device, you (or your accountability partner) can click "Synchronize with device" button online to push the new password to the device. Please make sure that the device has a working internet connection and Funamo protection is turned on. Otherwise, Funamo will be updated but it will not be automatically restarted and it will be in the protection off mode after the update. If you have any problem with automatic update, you may disable automatic update for Funamo in Google Play Store (the checkbox for Allow automatic updating is on Funamo page in Google Play Store) and do a manual update when you see a new version is available. Should Settings and Google Play Store be protected? How can I allow basic settings and access to Play Store without my password? Settings and Google Play Store app should be added to the protected apps list to prevent users from forcing stop, changing permissions or uninstalling Funamo Parental Control or Funamo Accountability. They were both protected by default in older versions, but due to Google policy changes, now you need to add them yourself to achieve the best protecction. Android devices provide shortcuts to some basic settings such as turning on/off WiFi, Bluetooth, GPS and adjusting brightness from the notification bar. Most Android devices also come with a widget called Power control or you can find similar widgets on Android Market/Google Play Store. Regarding connecting to open WiFi hotspots, if you are using Funamo Safe Browser, we would recommend apps such as WiFi Manager (you may search on Google Play) which allows complete WiFi settings. In general, you can allow the YouTube app but enable SafeSearch to block out inappropriate content. Now Youtube app has SafeSearch enabled, we can add youtube.com to the blacklist so kids can't access it through the browser. You can do it by going to Internet filtering -> Add website blacklist. Click add and enter youtube.com, then click OK.
Add the YouTube app to the protected list so that it always requires your password to launch. 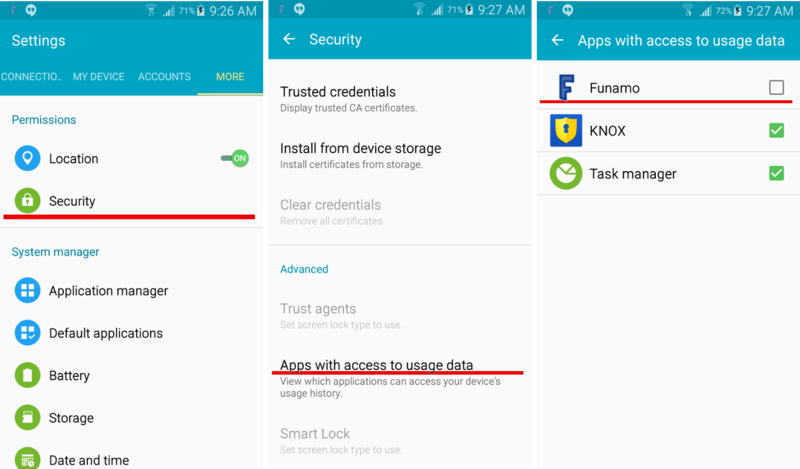 You can do it by opening Funamo app, then go to Protected apps, click Select applications. Then select YouTube app from the list, then click Save button. Add youtube.com to blacklist as we described above. First, please check if the logging for the specific activities is enabled. You can find those settings in Funamo -> Account settings. Once they are enabled, all activities are logged automatically. You can access the history both on the device and on the web. The history data on the device is real-time, but we only upload the history data to the server once a day between midnight and 5am to minimize the impact on your regular use because sometime the history data can be big depending on your usage. But you can always do a manual sync either on the device or from the web. On the phone, please go to Funamo->Account settings->Manually sync with server. On the web site, please select the device on the right hand side and click Synchronize with device button. To sync from the web site, Google push has to be registered when you initially set up Funamo. Or you can go to Funamo->Account settings-> Register push service to do it after your initial setup. Please note that sync from the web may not work if the device is turned off or the device does not have a working internet connection. Sometimes when Google's push server is busy, it may also postpone the push notification to a later time. The location data is uploaded to Funamo server in real time. All other device data such as calls/SMS/web/application are still uploaded each night. Please make sure that you enable either mobile location service or GPS location service. Please open Settings, then under Location services, please make sure that either Google's location service or GPS satellites is selected. Google location service uses mobile networks. It is not as accurate as GPS but it consumes much less battery power. On the other hand, GPS is very accurate but consumes more power. This could happen for the following three reasons: (1) The device is turned off (2) The device does not have internet connection or (3) Funamo is not running properly on the device. So please check the device to see what's the problem. Please note that sync does take some time depending on how much device data it has accumulated since the last sync. So please give it at least a couple of minutes and refresh the page to see if sync has finished. Funamo uses Google push service for sync from the web. It is rare but in case Google push server cannot keep up with all the push requests, it may postpone the push notification. First of all, make sure that Funamo Browser is not in the protected, time-limited or time allowance list. If you still get the login page, most likely, it is because you have selected the built-in browser as the default for the action to open any web link. Since now you are blocking the built-in browser, you would get the Funamo login page. To solve it, please open Settings then go to Apps (or Applications->Manage Applications for some models). Swipe left until you see "ALL" tab. Select the built-in default Android browser from the list. Scroll down and you should see a button called "Clear Default". Click it to clear the default setting. Now, try to open any web link, you should get a popup asking you which browser to use. Please check "Use by default for this action" and click Funamo Browser. Now, it will make Funamo browser the default browser to open links rather than the built-in browser. In Google Search settings, enable SafeSearch. Once Funamo protection is enabled, the Settings page is protected by Funamo and it cannot be accessed without the password. You can only run one copy of Funamo on a device that supports multiple accounts. The web filtering should work for all accounts because network settings are shared. The application control would only work for the account where Funamo is installed. So we would recommend that you setup the main account on your Android device as the admin account and setup a separate user account for all kids to share. You should install Funamo parental control in the kids' account. Doing so also prevents user from bypassing Funamo using a guest account (for devices running Android 5.x Lollipop or later) since a user account does not have the capability to open a guest account. If you see this message, it means that your device has been upgraded to Android 5.x Lollipop and you need to enable Funamo for accessing application usage data. For most device models, Funamo opens the right page where you can simply enable it by checking the checkbox for Funamo. In case where Funamo cannot automatically open the page, you can do so by going to the Settings app (not Funamo) and under Security section. Here are the screenshots for Samsung device for your reference. How do I log web history? Web history is logged for Funamo Safe Browser, Android browser and Chrome browser before Android 6.0 (Marshmallow). For Android 6.0 or later, Funamo can only log history from Funamo Safe Browser due to Google's new security poilicy. Please go to System Settings -> About phone. Then look for Android version or Firmware version.